Cambridge Audio CXN (V2) review | What Hi-Fi? To improve on something that’s already pretty good, sometimes all you need is a light touch. That’s what Cambridge Audio has done with the second iteration of its CXN streamer – an update to the Award-winner we reviewed in 2015. 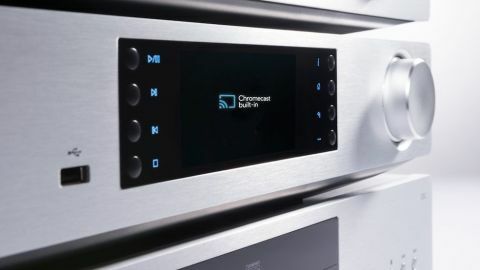 Now, alongside Tidal built-in and Spotify Connect, you can also stream music via Google’s Chromecast, on this, the Cambridge Audio CXN (V2). The Cambridge Audio CXN (V2) has kept all of the great sonic characteristics of the original. That same vibrancy and enthusiasm that greeted us three years ago hasn’t changed much in the time since. We play Landslide by Fleetwood Mac, and Stevie Nicks’ soulful, sweet singing is full bodied and beautifully conveyed. The way she shifts between notes is smooth, and the occasional words clipped to keep her rhythm are snappy and insightful. Even the odd vocalisation – the hums and aahs – are detailed and full of melancholy musings. Most half-decent streamers could reproduce the basics of this song, but it takes something more talented to dig into the emotional core of this track and deliver it – and that’s what this Cambridge does. With something more bouncy and upbeat, such as Warren Zevon’s Werewolf Of London, the CXN delivers both a punchy bass and a tinkling treble simultaneously. A good streamer, tackling those few opening bars, needs to balance both the deep drum and the piano – which the CXN (V2) does impressively. The bottom end is weighty, but lithe enough to give you a good kick, while the piano is light and airy without being overly bright. The timing is tight and gets your foot tapping almost immediately. We described the original’s sound as ‘wonderfully entertaining’, and it’s nice to hear that Cambridge Audio has retained that quality in the V2. We play Childish Gambino’s This Is America, a song which overlays a grumbling, rolling bass with the clicks and taps of percussion and a multitude of different voices. Some hi-fi will lose sounds in the turmoil, but the V2 manages to separate each element out and present it as a cohesive whole. No need to keep it simple here, the CXN (V2) will be able to keep the complex coherent. Top of the list of new features is the Chromecast capability that sets this version apart from the original. Following a firmware update in September 2018, the CXN (V2) now supports Chromecast Built-In, enabling users to stream content wirelessly from compatible apps. We set up the Chromecast with no problems, and in just a few moments are casting music and videos to other devices. For those on Apple’s ecosystem, meanwhile, AirPlay is built into the streamer so you can send your music via your iPhone, iPad or other Apple device to your speakers. Although you’ll only get first generation AirPlay for the moment, Cambridge Audio says it’s working on a solution for implementing AirPlay 2 ready for later this year. Spotify subscribers can also use Spotify Connect to send their music to the CXN directly from the app, while Tidal subscribers can search the streaming service’s database directly from the streamer, once you’ve logged into your account using the Cambridge Connect app. The app, available on iOS and Android, can also be used to control playback. But as always, we’d recommend a wired connection for the best sound quality. This streamer is capable of playing high-resolution files of up to 24-bit/192kHz, upsampled to 384kHz, through the USB type B input for your computer, optical and coaxial inputs. Also included are a pair of RCA and balanced XLR outputs, along with two digital outputs. The only other change to the CXN (V2) is a faster processor to handle the Chromecast functionality. Cambridge Audio claims the CXN will operate faster, and with the two streamers side by side, the newer one boots up faster and gets to our music notably quicker than the original. If it ain’t broke, don’t fix it seems to have been Cambridge Audio’s motto here – and the build quality of the CXN (V2) seems exactly the same as the old CXN. It’s a premium quality that’s reflected in the buttons and the recently redesigned remote control – both of which are easy to use and responsive – while the volume dial retains that signature weighted resistance that gives a satisfying sensation when moving through menus. The 4.3in screen shows track, artist, album and sampling rate, with album artwork in full colour. It never feels cluttered and each bit of metadata is spaced nicely. Having input labels printed upside down is also a thoughtful touch – meaning you can easily read them when you’re looking down on the streamer. While we don’t believe in foregone conclusions, the Cambridge Audio CXN (V2) might be the closest we’ve come to one. The additional Chromecast technology only grants more functionality to an already great streamer. Cambridge CXN vs Chord Mojo/Poly - which music streamer is the best?